On Sunday, an image exploded across the Internet of Donald Trump, Saudi Arabia’s King Salman, and Egyptian President Abdel Fattah al-Sissi placing their hands on a glowing orb, surrounded by pleasant onlookers. No one, even those who claim to, really understands why. 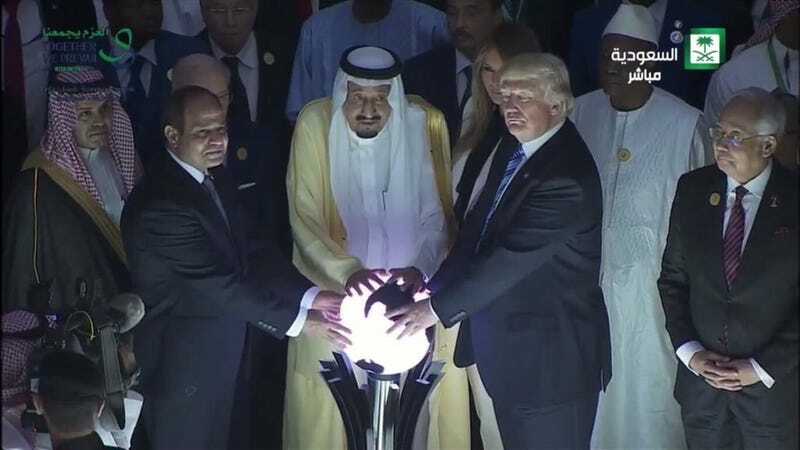 Newsweek promised to demystify the viral orbgasm in an article published Sunday called “Why Donald Trump Touched a Glowing Orb in Saudi Arabia.” The article cooly explains that the image depicts Trump at the opening of the Global Center for Combatting Extremist Ideology in Riyadh. But why is he touching a glowing orb? “During the center’s opening ceremony,” the article goes on, “the leaders placed their hands on the globe in a gesture of solidarity to launch the center.” No, I am not satisfied with this explanation. Glowing orbs conjure images of sorcery, Middle Earth, and Sith Lords. They are not symbols of global solidarity. Literally anything else makes more sense. Maybe the Global Center for Combatting Extremist Ideology only has one orb left and these three men all want it. Maybe Trump’s been led to think the orb has magical powers. That is definitely the face of a man who believes he will soon be growing his own hair again. Or, could it be that Trump was lured to the center in the first place by the promise of getting to do freaky orb stuff? The US President is moaning loudly, rhythmically, and everyone around him is pretending not to notice.